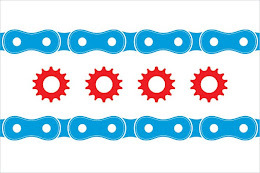 On June 6, 2013, the Chicago City Council approved the 2013 Bicycle Safety Ordinance. Changes to the Chicago Municipal Code must first pass a committee and then go to a vote before the entire Chicago City Council made up of the City's aldermen. The proposed changes, sponsored by Mayor Rahm Emanuel himself, were originally presented to the City of Chicago's Committee on Pedestrian and Traffic Safety on May 8th and then passed in the City Council . Current Law: The penalty for interfering with a bicyclist while turning, riding in the bike lane or passing, was $150.00 total. The penalty for causing a collision while turning, riding in the bike lane or passing was $500.00. The penalty for not exercising due care and interfering with a bicyclist was $150.00; the same act that results in a collision was potentially $500.00. The penalty for interfering with a bicyclist with a car door could result in a penalty of $150.00, a dooring that results in a collision could be a penalty of $500.00. Amendment: Not yielding the right of way to a bicyclist while turning, riding in the bike lane, or not yielding the right of way while passing or otherwise interferes with a bicyclist could result in a fine of $150.00 for EACH offense. The same acts that result in a collision results in a mandatory fine of $500.00 . A dooring that interferes with a bicycle will carry a mandatory fine of $300.00; causing a collision in a dooring would result in a mandatory fine of $1,000.00. Current Law: No vehicle may impede a bike path or lane. Amendment: Language is added to clarify that a bus may stop in a bike lane at a bus stop to load and unload passengers, if the bus has an emergency, or during overnight hours as necessary in an intersection if it is easier to load or unload passengers at that location. Current Law: Only buses may operate in designated bike lanes. Amendment: If a lane is marked for buses AND bicycles, then the bus must yield to the bicycle until it is safe to pass the bicycle and the bicyclist. Current Law: A person riding a bicycle who violates the Chicago Municipal Code would be fined $25.00. Amendment: A bicyclist, unless specifically provided elsewhere in the Code, would face a fine of $50.00 to $200.00 for each offense. Current Law: Bicyclists over the age of 12 should not ride on sidewalks. Amendment: Bicyclists of any age may ride on the sidewalks outside of the Loop if the sidewalks is marked as a bicycle route, is used to enter the nearest street or to get to a bicycle sharing station. Current Law: A bicyclist should ride as near as is practicable to the right side of the road. Amendment: A bicyclist may ride as near as is practicable AND safe to the right side, meaning a bicyclist can move to the left to pass another bicycle, in order to turn left, to avoid hazards, or to navigate a right turn. A bicyclist may also pass on the right of a slower moving motor vehicle or bike. However, if a vehicle (i.e. cab) is letting out passengers from its right side, the bicyclist must yield to pedestrians or pass on the left. If the street is a one-way street with two or more lanes, the bicyclist may also ride alongside the left side of that one-way street. Current Law: This specific section as it pertains to bicycles is new. Amendment: Adds precise language, specific to bicycles, as to the required hand and arm signals for a bicyclist. A left turn is with the left hand and arm extended horizontally; A right turn is the left hand and arm extended upward or right hand and arm extended horizontally; a stop of slow down is the left or right hand and arm extended downward. Current Law: Pedestrians have the right-of-way over vehicles at a plainly marked crosswalk at an intersection or between intersections. Amendment: Pedestrians have the right-of-way over vehicles (including bicycles) at any crosswalk, plainly marked or not. Current Law: Pedestrians had to yield right-of-way to vehicles unless crossing in a marked crosswalk. Amendment: Pedestrians have the right-of-way over vehicles (including bicycles) anytime they are in a crosswalk, whether or not that crosswalk is marked. Attorney Mike Keating of Keating Law Offices is a trial lawyer in Chicago, Illinois who focuses his practice on representing bicyclists injured in bicycle accidents or crashes in Illinois. He is a former attorney for the Illinois House of Representatives in Springfield and is currently a member of the Legislative Committee for the Illinois Trial Lawyers Association. If you have any questions regarding this post or an issue involving Illinois personal injury law, please contact Mike Keating at 312-208-7702 or MKeating@KeatingLegal.com 24 hours a day, 7 days a week. All e-mails and phone calls are returned promptly.